This podcast was recorded yesterday evening in Michele Neylon’s office at Blacknight HQ. The Google re-organisation was announced later, so we don’t talk about it here. But there’s plenty more to talk about – and we got briefly sidetracked into talking about Denis O’Brien and his efforts to stop people talking about him. Good luck with that. Click on the player above to listen to the show, or download it here: 34:52; 20MB; MP3. We start by talking about Internet Governance. Michele has just been re-elected for a third term as chair of ICANN’s Registrar Stakeholder Group. It’s a voluntary role, but it sees him play a part in representing the interests of the domain registrar sector in the development of internet policy. That’s a role that is open to many different kinds of groups and organisations, under ICANN’s Multi-Stakeholder Model. And those in Ireland who want to know more will have an opportunity when the 54th ICANN meeting is held in Dublin in October. To encourage participation, there is is a pre-ICANN event being held on 17 September. Michele and other Irish participants will take part in a panel aimed at answering questions about ICANN. Michele recently wrote a blog post explaining how premium domain pricing works, which we also discuss in this podcast. 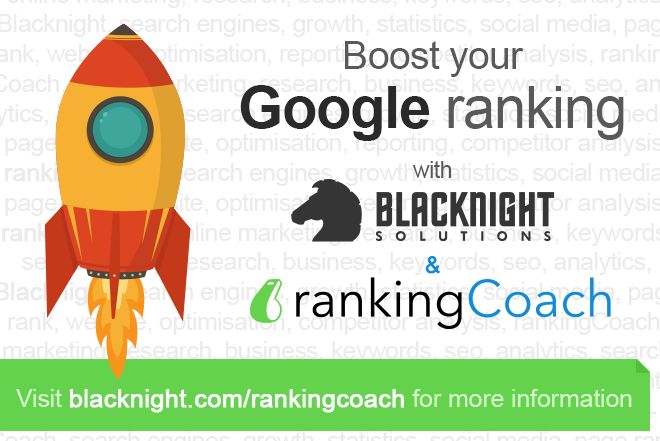 Finally, we talk about rankingCoach, Blacknight’s new product designed to help small businesses improve their search rankings and online marketing. Here: try it free for 30 days! Technology.ie is brought to you by Blacknight, Ireland’s leader in domains and hosting.